Over time, Myaamia people have lived in a wide variety dwelling types. The traditional home of the Myaamia is called wiikiaami (click to hear pronuncation). 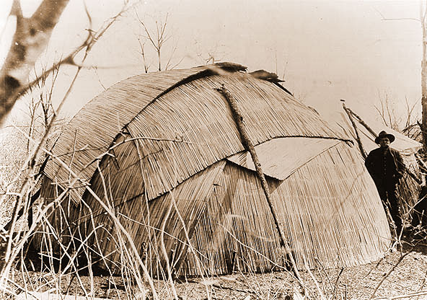 A wiikiaami is a domed structure that could be covered in cattail reed mats or bark depending on the season. Often these were also lined with bulrush mats, which were decorated. The layers of mats created an insulated space, which kept these dwellings warm and dry. Wiikiaami is often called a wigwam in English. Today, wiikiaami is a word that Myaamia people can use for any house or dwelling. This Kickapoo wiikiaami is like those still built by Myaamia people. The image shows the layers of cattail mats used to keep homes warm and dry. This wiikiaami was built by Myaamia people as a part of the Eewansaapita youth program in 2011. The cattail mats were provided by Dani Tippman. The group did not have enough to cover the roof, so a canvas tarp was used instead. Bigger families would extend their homes into a kinoonteewi (longhouse – click to hear pronunciation). 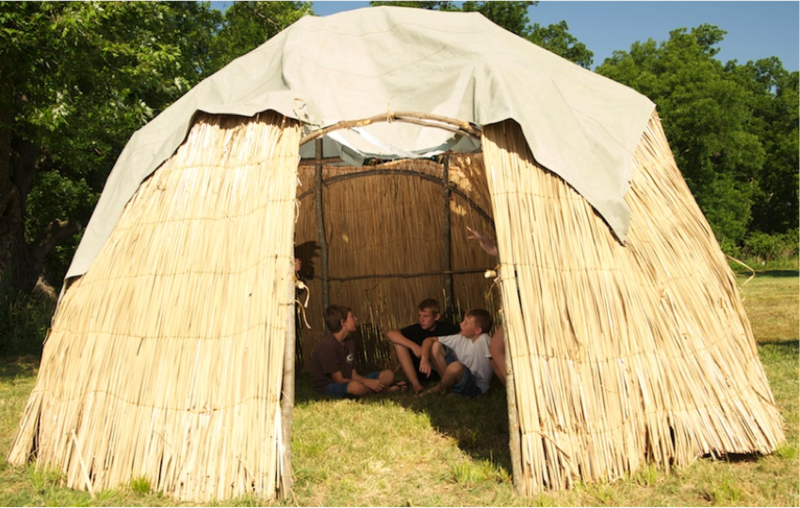 Each village usually had one kinoonteewi built to serve as an aacimweekaani (council house – click to hear pronunciation) for indoor meeting space during times of poor weather. When the weather allowed, council meetings and other larger gatherings were usually held outside in a designated place in the village. This generic kinoonteewi image approximates what a Myaamia longhouse looked like. This is the current aacimweekaani of the Miami Tribe of Oklahoma. 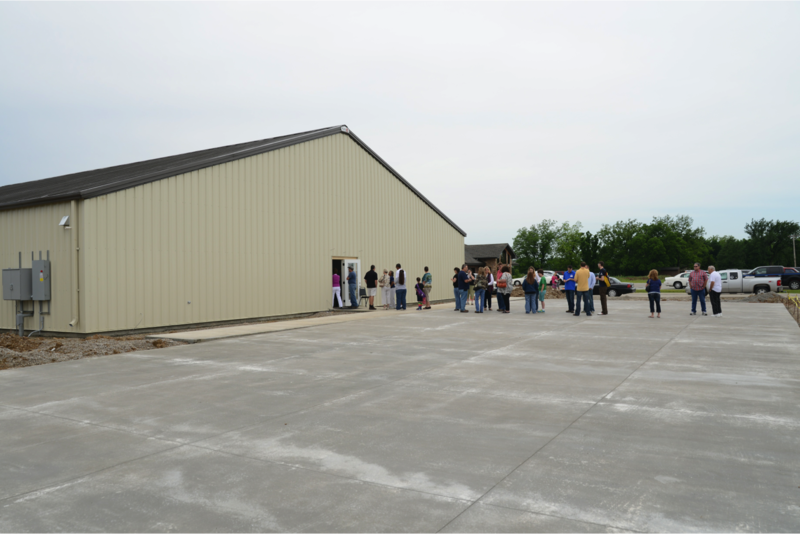 The line of people are those waiting to register to vote at the Tribe’s Annual Meeting. It is believed that Myaamia people would also build a summer house with a koonsikaani (porch) for use during the hot and humid times of the year. These structures allowed for a breeze to circulate and cool the family easily, while providing cover from rain. Beginning in the late 1700s, Myaamia people began to incorporate European architecture into their villages. By the middle 1800s, every village had quite a few structures that looked like the cabins their settler neighbors were building. In addition, leaders oftentimes had brick or wood frame houses built for them. These chief’s houses, served as important locations for trade, treaty negotiation, and tribal council meetings. 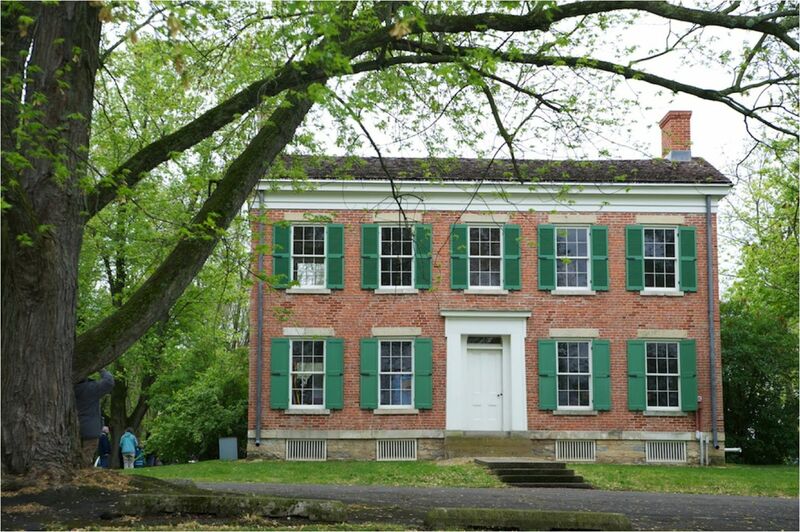 akima pinšiwa awiiki (Chief Richardville’s House) – this National Historic Landmark and former capital of the Miami Nation sits on Blufton Road on the south side of Fort Wayne, Indiana. In the late 1800s, Myaamia land ownership completed a radical transition from collective ownership to individually held and titled lands. In this period, many families built what today are called allotment houses. These homes were located on individual parcels and not in villages. Allotment houses were built to be the self-sufficient center of an individual family’s farm operation. 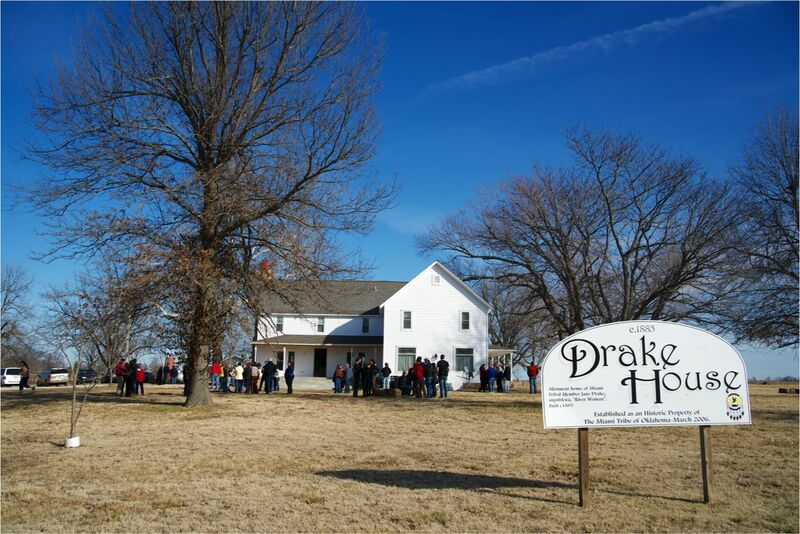 Today the Miami Tribe of Oklahoma owns two of these family allotment houses: the Drake House and the Geboe House. siipiihkwa awiiki (Jane Drake’s House) – this allotment house was originally built around 1885. Today it is owned by the Miami Tribe of Oklahoma and used for gatherings and celebrations as well as housing staff during educational programs. akima kitasaakana awiiki (Chief David Geboe House) – this allotment house was built in the late 1800s and remained in the Geboe family into the 20th century. 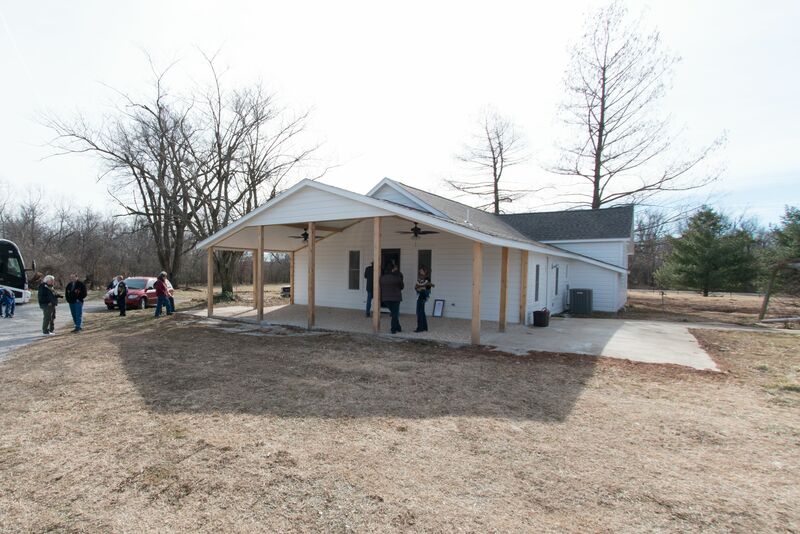 The Miami Tribe of Oklahoma renovated the home in 2014 and it now serves as trailhead for cultural education and housing for tribal staff. niikinaana (our homes) have changed over time, but they remain obviously important to the lives of Myaamia communities. niikinaana are the central place where our future as a community is formed. Increasingly, niikinaana are playing a pivotal role in the education of Myaamia children in Myaamiaataweenki (the Miami language) as it was generations ago in Myaamia villages. The are no definitive sources from the historical record that describe a summer house or a koonsikaani (porch), however the language records indicate that Myaamia people did build structures that were used for shade in the summer and most Great Lakes indigenous groups built similar looking summer houses. This image is a estimate of what a Myaamia summer house possibly looked like.